In the heart of Soča valley is located village named Žaga. Posestvo Blata is nearby village and its primary activity are horses. Beautiful surroundings can be unforgetable experience from the horseback. Closeby Soča river and peacefull nature of Posestvo Blata is perfect for everybody who wants to relax in the company of horses. Posestvo offers you different activities: riding pony for children, riding big horses for elder children and adults, trail riding and all day activities with horses. Ne odlašajte z odločitvijo! Rezervirajte nastanitev v hostlu Soča rocks in užite izjemno priložnost v dolini Soče! Don’t hesitate to call! Book your stay in Hostel Soča rocks and get some unique experience in Soča valley! Have you ever tried to HITCHHIKE? If your answer is NO we can guarantee you that there is no better place to start your hitchhiking expedition than Soča valley. Not far from Bovec you have some lovely destinations you can reach by car. Lakes of Fusine (Belopeška jezera in Slovenian) are two lakes located under the Italian side of Mangart mountain. A cycling trail from Tarvisio and Kranjska Gora leads to the lakes . If you are in a search of a place to have a nice pic-nic, the lakes of Fusine won’t disappoint you. Hostel Soča rocks’ tip: Grab a frisbee , some beers & have a nice picnic by the upper lake. Kozjak waterfall is easily accessible from Kobarid, town 22 km away from Bovec. The waterfall carved an underground hall. Its bottom is covered by a vast blue and green pool, and its walls are reminiscent of those in the Karst caves. Hostel Soča rocks’ tip: On the way you will pass Napoleon Bridge and the best pancake place in Soča valley. The Tolmin gorges are situated at the lowest and the southernmost entry point into the Triglav National park. The main attraction is a the “Bear’s head”, a natural bridge – a large rock which got stuck, who knows when, between the walls of the Zadlaščica canyon. Hostel Soča rocks’ tip: Dare to look down from Devil’s bridge into deep gorges. The lake is located at an elevation of 969 m (3,179 ft), situated in a high valley of the Julian Alps, north of the Sella Nevea. In the east, the Predil Pass road leads up to the Slovenian border. With a surface area of about 1 km2 (0.39 sq mi), it is the second largest natural lake of the Friuli-Venezia Giulia region. Due to its picturesque setting beneath the Kanin massif, the lake is a popular tourist destination for hikers and day-trippers. A small town just 40 min away from Hostel Soča rocks, it is a protected UNESCO heritage sight. The symbol of Cividale del Friuli is the devil’s bridge, which divides the town on two sides. The bridge has been standing here since 15th century and was renovated in 1918. At the end of the bridge are steps, leading down to Natisone River, which offers great views up to the town and river cliffs, where the town was built. Did you know that Bovec has, besides all the natural beauties a very sad history from World War I? Battles of the Insonzo (or Soška fronta) took place between June 1915 and November 1917. There were a series of 12 battles between the Italian and Austro-Hungarian armies, mostly on the territory of Slovenia. Because of the harsh terrain of the battles, they are considered to be some of the toughest battles of World War I. In order to protect and consolidate their battle stations, soldiers built and carved caverns and also dug trenches. These alterations have been left as a permanent reminder in the landscape of the rocky mountains. Are you keen on visiting these historical places? If the answer is YES, you should definitely check out the places bellow! Fortress Kluže is located 4 km from Bovec towards the Italian border. The first wooden fortress was built in the 15th Century and was used for protection from the Turks. During the reign of Napoleon Bonaparte it was burned and demolished. The latest version of the fortress was built by Austro-Hungarians in 1881-1882. It was designed as a control point between Bovec valley and pass Predel. Today it serves as a museum with permanent and temporary exhibitions it also serves as a place for summer events. In the complex of buildings of Bovec obstruction is also so called ”Upper fortress” or Fort Herman. You reach it by following the trail through the tunnel besides the car park at Fort Kluže. Fort Herman was built between 1897-1900. Its primary role was to control the Bovec valley with their heavy guns. There is a circular route which leads around the museum, within a relatively small area there are many remains. Besides the fighting and connecting trenches you will also find caverns, bunkers, machine-gun emplacements and barracks. You will find the remains besides the main road Bovec-Predel/Vršič pass before the intersection. OUTDOOR MUSEUM ČELO The main part of the fort is 200m long shooting trench that connects two altilery positions with an observatory. The fort is part of Bovec obstruction and its main purpose was to defense from an Italian attack. The museum is accessible from Kal Koritnica village located 4km from Bovec in direction towards Vršič pass. You reach the cemetery if you follow the main road from Bovec to pass Predel or Vršič. It is located on the first intersection in this direction. The cemetery was expanded and renovated several times after World War I. Records show that there are approximately 700 Austro-Hungarian soldiers buried here. Behind the church of St. Štefan in Log pod Mangartom is located another military cemetery of Austro-Hungarian soldiers and is known to be one of the most beautiful ones. There are buried around 800 soldiers, most of the soldiers were Muslim Bosniaks. Their graves aren’t marked with iron cross, but with muslim grave stones known as nišani. Did you know? The only mosque ever built in Slovenia was located in Log pod Mangartom, but it hasn’t perserved. It was built in 1916 by the Muslim Bosniaks who were known as one of the most fearless soldiers in WWI. Add a little ZEN to your holiday! Yoga is the perfect activity for athletes, hikers, travellers and relaxers alike. Our scenic yoga sessions, done throughout the beautiful Soča Valley, provide you with the perfect remedy for a day of paddling Soča, an adrenaline-rushed hike on Mangart or even the cherry-on-top of a relaxing day sightseeing. These 1-hour sessions are perfect for everyone, whether you’re a master yogi or you think downward dog is something an animal should do…we want you to join us! Yoga is an ancient practice meant to get you in tune with your mind and your body and has countless benefits following strenuous activities. Treat yourself to an unforgettable yoga experience in the heart of the Soča Valley! If you’re looking for a more personal experience and have specific requests for your yoga practice, we offer private yoga sessions on-site or out on location (spot chosen by instructor). This is also an option if you have a group of travellers and would like to have a private class with your group. Enquire by sending an email to: [email protected]. Yoga sessions will be held on a daily basis in the afternoon. The location and time will vary day-to-day; click here for the details of today’s session. You can choose to meet us at the location or meet at Hostel Soca Rocks, 10 minutes prior to the start of the session. Combine yoga with any of the adrenaline activities offered in Soča Valley for the perfect combination of adrenaline and zen! For all adrenaline junkies. This zipline is located above Bovec, in the Krnica valley, between two mountains reaching over 2000 meters high: Mt. Kanin and Mt. Rombon. 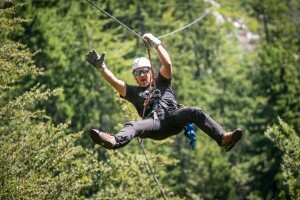 It’s one of the biggest zipline parks in central Europe and is by far the biggest in Slovenia. Are you afraid of heights? Face the fear and fly over Bovec, where your breath will be taken away by the adrenalin rush and unbelievable scenery of the ,magical Julian Alps around you. Can you imagine? 1300 meters above sea level. You are standing on a platform, looking ate your guide, a bit scared and nervous for what will happen next. Than he smiles at you and off you go! Suddenly your feet leave the ground and you are 200 meters in the air, flying free as a bird at 60 kmp into the unforgettable experience. Imagine that you can repeat this feeling five different timer on five wires 500-700m long. This is our zipline park. The adventure begins at our Active Planet offices in central town Bovec, where you get all necessary equipment, including climbing belt, helmet, and gloves. Following, is a 20-minute exciting drive in our 4X4 vehicles that will take you to Krnica valley, our first Zipline point. Once there, the tourist guide will advise you on all the rules you need to follow, explain the basics, and hook you up on the steel wire using special safety belt making sure you are safe and ready to fly. The drop down five steel wires is 3km long and approximately 200 m above ground. While dropping, you can reach a velocity of 60km/h. The adventure ends about 300m lower, slightly above Kanin’s gondola lift B station. The adventure takes at least 3 hours, we highly recommend you wear comfortable clothes and sport shoes.